Motorola will deliver an Android-powered touchscreen smartphone to Verizon in the fourth quarter, says a company source. Motorola ( MOT needs Google's ( GOOG - Get Report) Android to succeed if it wants a chance at a new life. It also needs a major telco partner that can sell the device to millions of people. Those stars seem to be aligning. Motorola will deliver an Android-powered touchscreen smartphone with a Qwerty keyboard to Verizon ( VZ - Get Report) in the fourth quarter, says a company source close to the plan who requested anonymity. It hasn't been any secret that Motorola tossed out its Microsoft ( MSFT - Get Report) Windows Mobile plans this year in favor of Google's Android operating system. It was a bold bet on an iffy software, but Cupcake, the new version of the Android system, has been a pleasant surprise. After nearly 24 hours of trials in TheStreet labs with T-Mobile's new Android Cupcake powered MyTouch phone from HTC, it is starting to look like Google's Web-friendly phone software works pretty well. 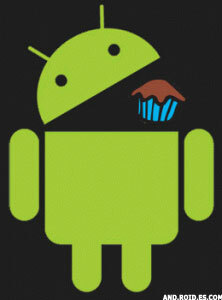 Android Cupcake may be Motorola' sweet treat. If Android's Cupcake continues to prove itself, it would be a welcome development for Motorola, which also has Android devices headed to Deutsche Telekom's ( DT T-Mobile this year. Verizon could always use an attractive new phone to add a little zing to its lineup. AT&T's ( T - Get Report) success with the Apple ( AAPL - Get Report) iPhone has been a huge growth driver for both companies. This is all bad news for Microsoft ( MSFT - Get Report) and Nokia ( NOK - Get Report), which have been slow to adapt mobile phone operating systems to the new touchscreen poke-and-swipe interface.